Quality health care means doing the right thing — for the right patient, at the right time, in the right way — to achieve the best possible results. Patient-safety practices protect patients from preventable harm associated with health care services. Electronic health records (EHR) facilitate health care quality-and-safety improvements as compared to paper records. EHRs gives clinicians — as well as patients and their proxies —access to relevant patient information. EHR systems also offer integrated best-practice support in the form of electronic Clinical Decision Support (CDS). CDS gives care teams general and person-specific information —intelligently filtered and organized — at the appropriate times. 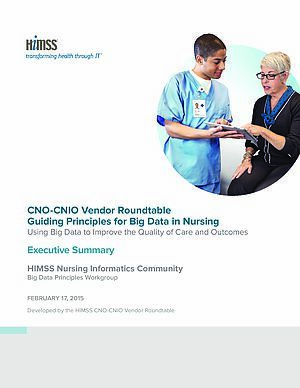 This improves care outcomes by making timely information — that supports sound decisions — available to the care team. EHR systems also play a role in improving population health. They process large amounts of aggregate health data and can support both trend and outlier analysis. This capability lets clinicians and public health professionals take action to improve outcomes. As we look to improve our nation’s health, these population-health activities become increasingly important. And, as new care models evolve and focus on both population and patient outcomes, EHRs make meeting quality-reporting program requirements more efficient. Clinicians can use automated EHRs to harvest performance measurements from data routinely captured in the course of care. We refer to Electronic Clinical Quality Measures (specified in standard format for automatable, interoperable electronic reporting from the EHR) as eCQM. Like all powerful tools, EHR systems carry risk with use. However, you can minimize unintended consequences by following best practices for the design, implementation, user training, and use of your EHR. Planning is essential to get the most out of your EHR investment and to ensure its safe use. 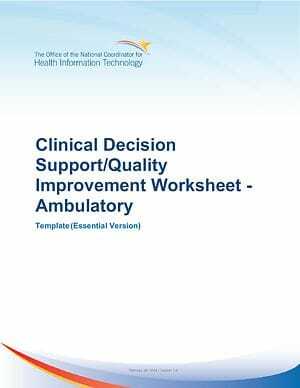 The resources provided throughout this Playbook provide clinicians with a starting place to use their EHR to improve care quality and safety. Patient safety refers to freedom from accidental or preventable injuries associated with health care services, and an electronic health record (EHR) system provides tools to help clinicians improve patient safety. EHRs plays a part in a larger system comprised of the clinical team, the patient, and the daily supporting workflows. When analyzing EHR safety, be sure to consider the entire system as a whole. These webinars provide a great introduction to the various ways you can improve patient safety with health IT. 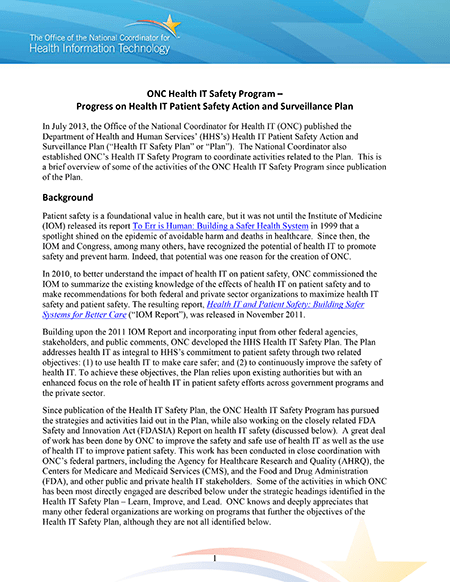 The ONC Safety Assurance Factors for EHR Resilience (SAFER) Guides' recommendations illustrate what practices need to do to achieve safe and effective electronic health record (EHR) implementation and use. The recommendations should be considered proactive risk assessments that aim to mitigate and minimize EHR-related safety hazards. 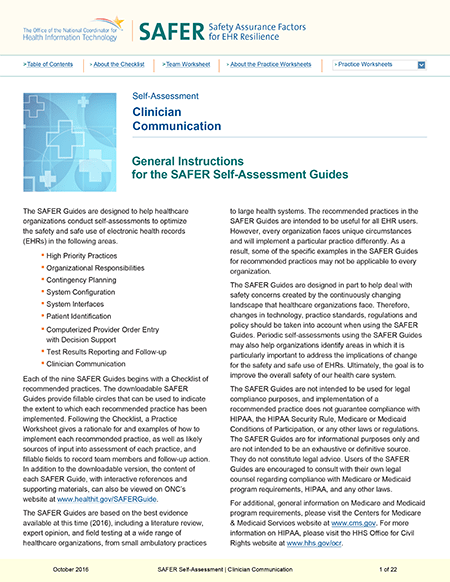 Each SAFER Guide consists of between 10-25 recommended practices which can be assessed as “fully implemented,” “partially implemented,” or “not implemented.” Recommended practices help the clinic know what to do to optimize the safety and safe use of the EHR. Examples accompanying each recommendation are designed to help EHR users and developers meet each recommendation. Meeting SAFER recommendations is a team effort and requires users in your practice, those responsible for setting up your EHR, and, in some cases, help from the EHR software developer to work together. 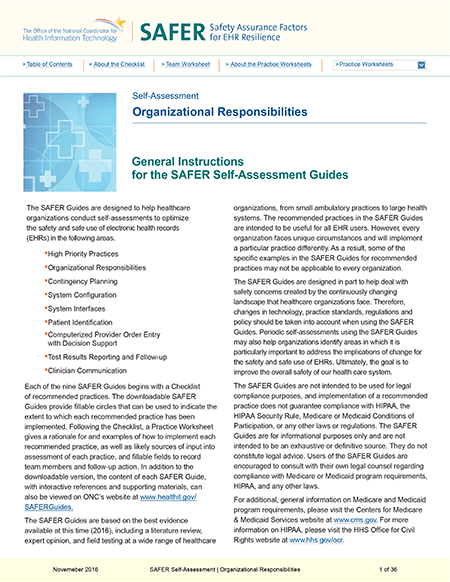 The EHR developer might also have an EHR-specific manual for those responsible for configuring and implementing the EHR to help them learn how to meet the recommendations. Many recommendations may require adjusting specific EHR configuration parameters and others involve strengthening workflows — the steps your office takes to deliver care to your patients. So, the practice should review your internal policies and procedures to ensure that they are addressing the SAFER recommendations directly under your control. For example, you should make sure that your practice has a well thought out paper-based system for documenting your activities and ordering new medications, tests, and procedures when your EHR is unavailable (see the Contingency Planning Guide). In small practices that use a remotely-hosted EHR solution, the clinicians should ask those responsible for configuring and maintaining their EHR to document which of the SAFER recommendations they have implemented. 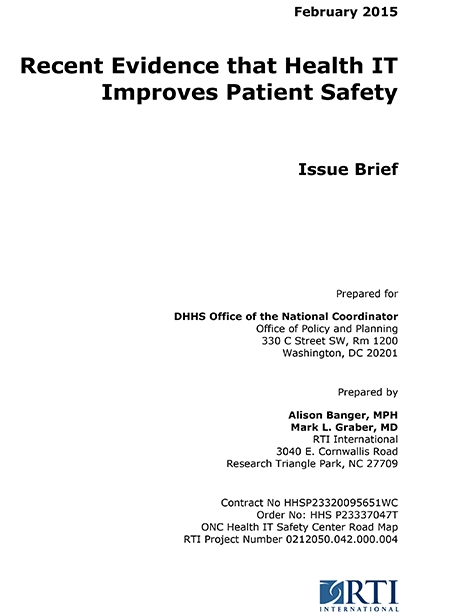 ONC organizes SAFER Guides into 3 broad groups: foundational, infrastructure, and clinical-process. 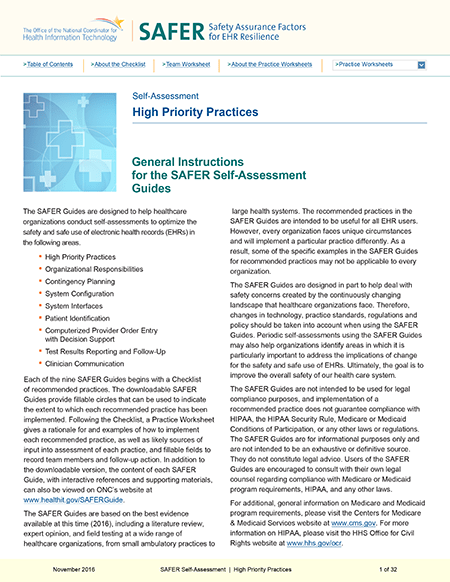 High Priority Practices*: This guide helps you assemble and equip a safety team to determine the safety practices you need to address first — and then decide which other SAFER Guides to use next. Organizational Responsibilities*: This guide, designed primarily for larger health care organizations, focuses on human behavior and relationships. It’s organized differently than the other guides and includes principles that apply to people who have responsibility for patient safety in EHR-enabled health care organizations. 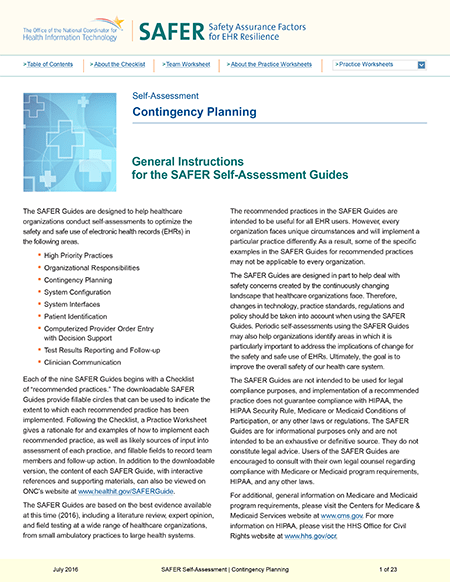 Contingency Planning*: This guide offers recommended safety practices associated with planned or unplanned EHR unavailability (downtime) — instances when clinicians or other end users can’t access all or part of the EHR. 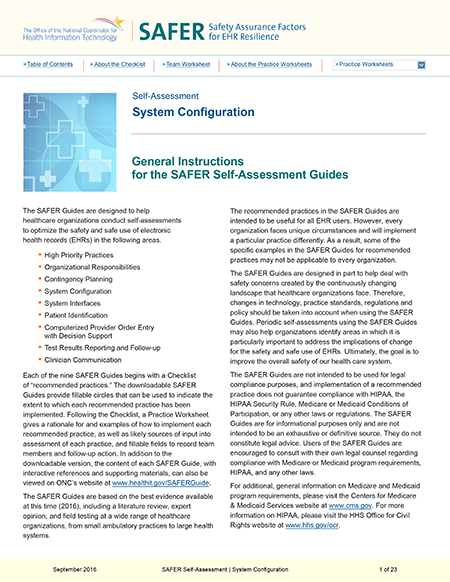 System Configuration*: This guide provides recommended safety practices associated with setting up (configuring) EHR hardware and software. Configuration includes the EHR system’s physical environment, the hardware and software infrastructure, and the maintenance processes. Configuring an EHR — which involves numerous decisions that profoundly influence performance and safety — must be handled by the configuration team. 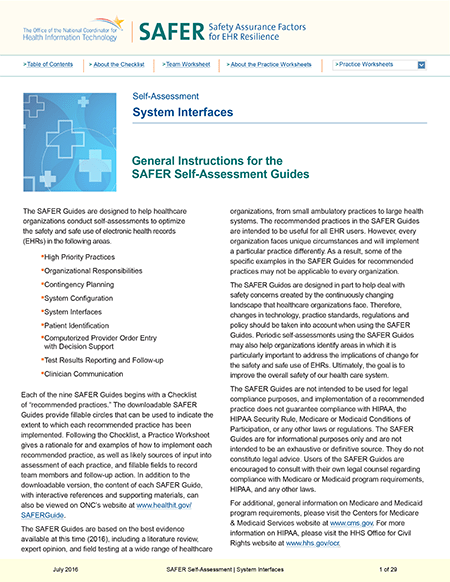 System Interfaces*: This guide covers recommended safety practices for optimizing system-to-system interfaces between EHR-related software applications. Maintaining enterprise or community-wide clinical information systems involves integrating different software applications, often from different system developers. This guide helps organizations prioritize interface-related safety concerns. 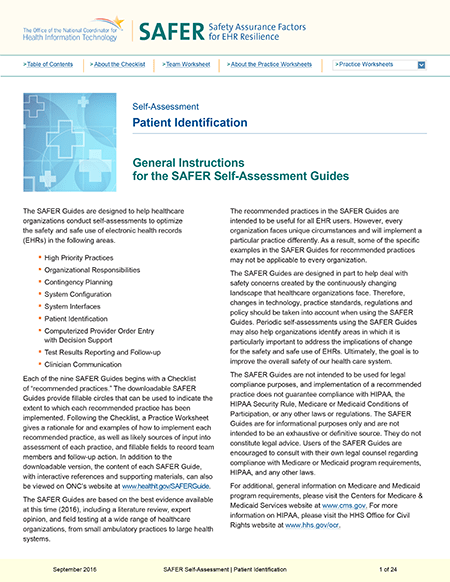 Patient Identification*: This guide looks at safety practices associated with accurate patient identification. These safety measures ensure that the information entered into — and presented by — the EHR accurately represents the correct person. Technology configurations alone can’t ensure accurate patient identification. 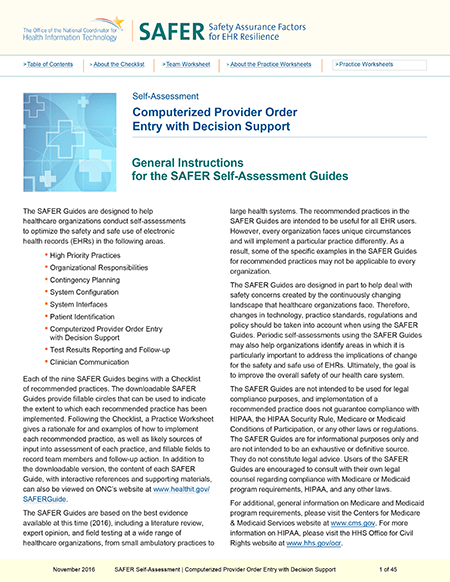 Computer Provider Order Entry (CPOE) with Decision Support*: This guide offers recommendations to improve medication safety and to ensure that clinicians who electronically order diagnostic tests and consultations remain in the communication loop. 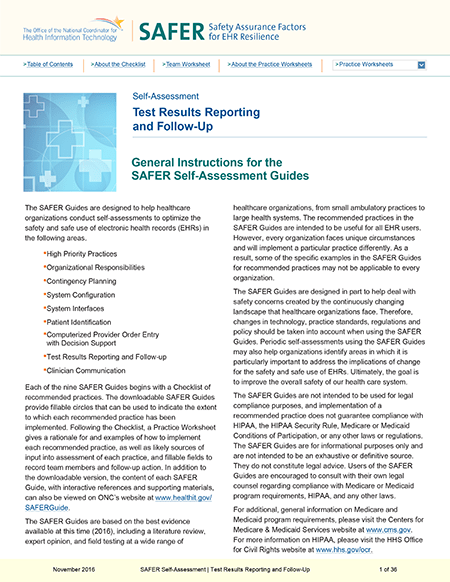 Test Results Reporting and Follow-Up*: This guide covers recommended safety practices for the electronic communication and management of diagnostic test results. Failure to follow-up appropriately on diagnostic test results can lead to misdiagnosis, patient harm, and liability. These recommendations improve diagnostic test reporting, documentation, and follow-up of test results. Clinician Communication*: This guide will help your practice use an EHR to reliably send and receive: referrals and consultations, inpatient to outpatient transition communication, and clinical messages. 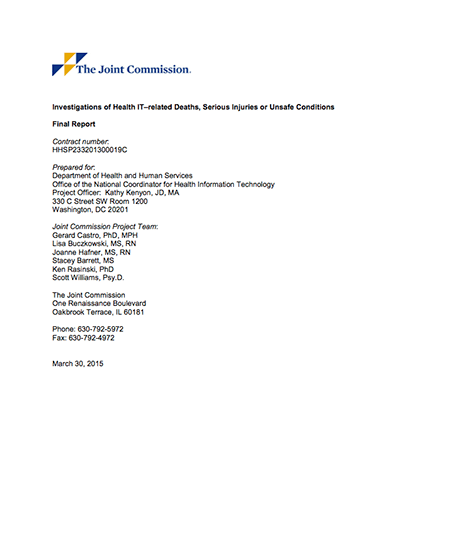 A report by The Joint Commission. 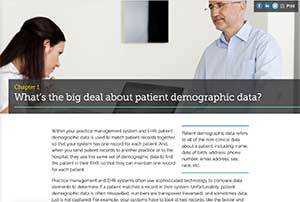 Patient identification is essential to patient safety, and you can’t achieve either if you don’t have accurate demographic data in the patient record. Today’s health-care settings usually handle high patient volume. A clinician’s front-desk staff manages a large volume of rapid check-ins and registrations each day, and they play a key role in creating and maintaining accurate demographic data. The following training module illustrates common pitfalls associated with incorrect demographic data. It also suggests ways that front-desk staff can minimize issues. In health IT, usability refers to how well the system supports the end user’s work, and the extent to which the user-interface design makes it easy for people to complete tasks while minimizing human error. Recommended reading: Better EHR: Usability, Workflow and Cognitive Support in Electronic Health Records. This book — available as a free download in PDF or iBook format — addresses the usability and cognitive support issues with EHRs. It was created by the National Center for Cognitive Informatics & Decision Making in Healthcare at the University of Texas, with funding support from the Office of the National Coordinator (ONC). Below, we explain these capabilities and discuss how to use your EHR to reach your quality-improvement goals. Clinical decision support (CDS) refers to information and tools that support clinicians and patients as they make clinical decisions at the point of care. CDS could be as basic as using a reference text to double check a treatment algorithm. Within an EHR, CDS tools offer more sophistication. They can present both general and person-specific information, filtered and organized, at appropriate times to appropriate people, including clinicians, practice staff, and patients. It’s important to think about which CDS tools will help your practice the most. If you’re selecting an EHR, carefully review its CDS capabilities to see if it fits your needs. If you already have an EHR, work with your EHR developer to enable and optimize the available CDS tools that benefit your patients the most. Clinical Decision Support (CDS) helps physicians talk with patients about which imaging tests are appropriate for their situation. These tools can help avoid unnecessary medical tests, resulting in higher quality patient care at a lower cost. Clinical quality measures (CQMs) gauge and track the quality of health care services to help find areas that need improvement, and they’re increasingly examined by payers. CQMs are typically expressed as a numerator and a denominator. 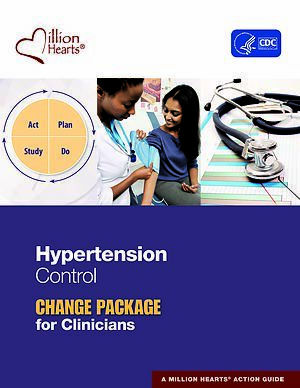 For example, a quality measure focusing on hypertension control for one doctor might have a denominator of “all patients with hypertension” and a numerator of “patients at target blood pressure.” CQMs also generally have a target percentage and are built on evidenced-based, professional guidelines. A variety of quality-improvement and public-reporting programs, including the Centers for Medicare & Medicaid Services (CMS), rely on eCQMs. The Office of the National Coordinator (ONC) certifies the capability of health IT, including EHRs, to accurately calculate and report specified eCQMs. Properly implemented EHR systems can calculate quality measures, and display results to the clinician for practice improvement. They can also be transmitted to payers, thus streamlining quality reporting. 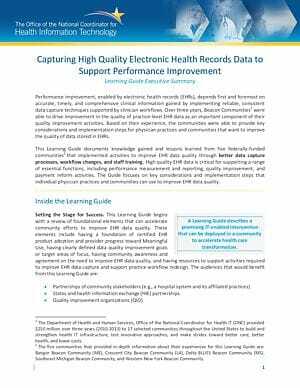 Properly implemented EHR systems can also help clinicians — who participate in a clinical-data registry — to measure and improve their care-quality performance. EHRs electronically extract and transmit data captured during normal care and documentation. This makes data abstraction, measure calculation, and feedback easier than possible with manual methods. Electronic clinical-quality improvement (eCQI) uses a variety of processes and tools to help improve care and to support better health. It’s not just a set of health IT tools — it’s also a process model that uses technology effectively to sustain a continuous improvement cycle. The current electronic-quality improvement ecosystem focuses primarily on eCQMs. They look at recent activities to determine whether each patient received the evidence-based standard of care. The next stage of health-care quality includes advanced CDS and increased end-to-end electronic quality-measurement and reporting. Rather than limiting quality improvement to retrospective measurement, CMS and ONC are working to provide standards that will let CDS use evidence-based medicine and the patient’s own history, preferences, and data — for truly customize care. The data collected through eCQM reporting will inform this advanced CDS which will, in turn, help inform future eCQM reporting priorities as a fundamental cycle in the learning health system. Use the following tools and links to further your understanding of electronic clinical quality improvement. Million Hearts® is a national initiative created by HHS, CDC, and CMS to fight cardiovascular diseases, which kill more than 800,000 Americans every year. Comprised of 120 official partners and 20 federal agencies, its continuing mission aims to optimize care, keep people healthy, and improve outcomes for priority populations. The Million Hearts® website contains a wide range of resources to help medical professionals educate, motivate, and monitor their patients. Under the site’s Tools menu, for example, you’ll find a section dedicated to health IT where you can download EHR optimization guides, developed by ONC. Please see HRSA’s Guide to Improving Care Processes and Outcomes for additional resources. This webpage provides strategies and tools that health centers and their partners can use to enhance care that’s targeted for improvement, such as hypertension and diabetes control, preventive care, and many others. Provide safe, effective, patient-centered, timely, efficient, and equitable care. Do you have a tip or suggestion for using health IT to improve quality and patient safety that's worked well in your practice? Share it here!